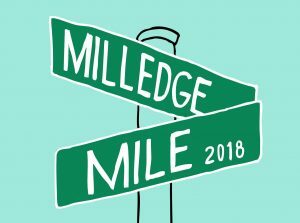 Athens Road Runners is hosting a new race—the Milledge Mile, a one-mile race down Milledge Avenue. When: Sept. 8, beginning at 7:30 a.m.
Where: Starts at Milledge and Dearing, straight down Milledge Ave. and ends at Five Points. Registration: $25 through July 31; $30 Aug. 1 until Active registration closes Sept. 5 at midnight. Registration: Sign up on Active or mail this form in. T-shirts: Guaranteed for runners registered by Aug. 19. Awards: Overall and top age group awards. Overall and top age group awards. CASH prizes to top 3 Male and Female ($500, $250, $100) plus $500 bonus for first male/female to break 4:00 / 4:30 respectively. Will run for beer: Every of-age runner can get a Creature Comforts beer after the race at The Pine. Please come out to run this race (free trainings Wednesdays at 5:30 a.m. at UGA track), help volunteer or cheer the runners on. We want to make Milledge Mile a signature Athens Road Runners event—like AthHalf or Peachtree—but ours. There aren’t a lot of mile races, so we hope to make this race something special. The Spring 2018 issue of the ARR Quarterly Newsletter is now live! This issue includes two race reports from opposite coasts, tips for running in rainy weather, two new team profiles, a book review, a recipe, and more. If you are interested in getting involved as a writer/contributor, or if you have a great story idea, email managing editor Cathryn Quinn! If you park in the Bottleworks lot for the Saturday morning group run, please be sure to register your car at the kiosk (first 90 minutes free); otherwise, please park on the street, or in front of the Flagpole building across from the Grit (exercise caution crossing Prince). The Winter 2018 issue of the ARR Quarterly Newsletter is now live! This issue includes the story of two longtime friends tackling their first marathon together, a Valentine’s special for those of us who have a non-runner spouse/partner as our biggest fan, two new team profiles, a book review, a recipe, and more. The third issue of the re-launched ARR Quarterly Newsletter is now live! This issue includes stories of running adventures some of our members went on this summer, two new team profiles, a book review, a recipe, and more. We hope you enjoy it. 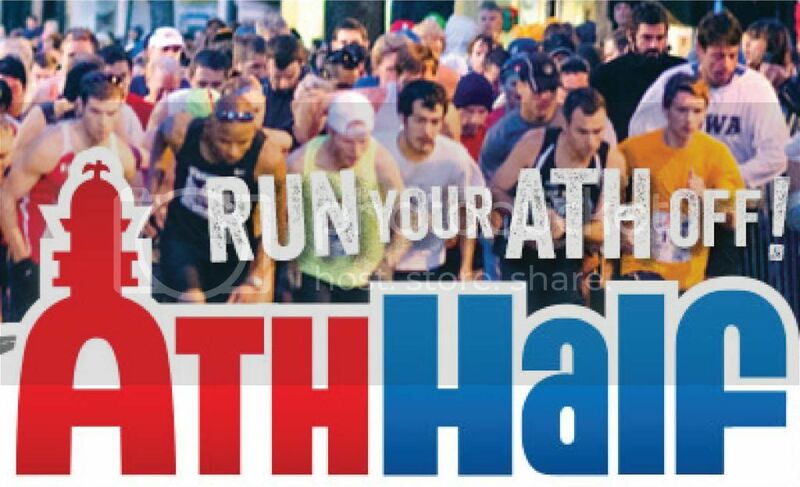 Get Ready, Get Set, Run your AthHalf off! Group runs begin and end in the parking lot of the Bottle Works in downtown Athens, GA. Current start time is 7:15AM every Saturday. Thank you to Hendershot’s Coffee for their continued support of the Athens Road Runners. Join us, inside Hendershot’s, for coffee after each group run. Be sure to thank the staff and tip your barista. Please remember that there will be more vehicles on the road, more visitors with a confused sense of direction, and likely irresponsible individuals under the influence. Take all precautions to remain safe, be aware of your surroundings, and follow the rules of the road while running. They’re here! Patriotic ARR shirts! 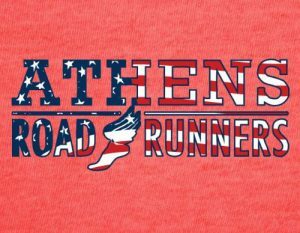 Stop by Fleet Feet Athens in Five Points this afternoon or tomorrow (Friday) to pick up your pre-ordered patriotic shirts! Those not picked up in the store will be brought to the Hendershot’s parking for pickup *before* Saturday’s group run, after which they will be back at Fleet Feet for pickup through the weekend and July 4th holiday. $20.00 Pre-sale through Sunday, June 18, 2017. 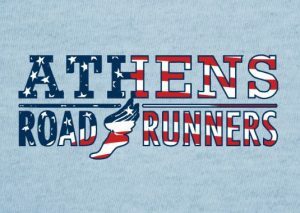 Order forms and payment may be delivered to Athens Running Company, Fleet Feet Athens, or to Tino Johnson directly. Shirt will be available for pickup after June 30, 2017. Back by popular demand ARR patriotic shirts are on sale just in time for the 4th of July. If you missed purchasing a shirt last year, you know how it feels to not have one of these shirts. If you purchased a shirt last year, you know how AMAZING it was. Regardless, you will want to purchase shirt this year for the first or second time. With two really cool options you may want to purchase both.